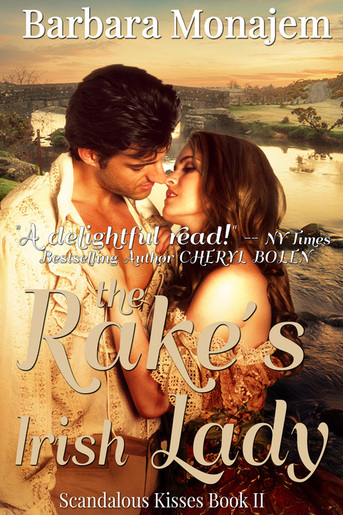 Here's an excerpt from The Rake's Irish Lady. Bridget crept past the mews in the murky London darkness and into the tiny garden. She’d planned it all ahead of time, so she knew exactly where to go. She knotted her skirts front and back, climbed onto the rain barrel, shinned up the drainpipe, and pulled herself onto the roof of the bump-out behind Colin Warren’s lodging house. The bump-out housed the landlady; conveniently for Bridget, Colin occupied rooms on the first floor at the back. His windows could be accessed from its roof. It wouldn’t have come to this if Colin Warren wasn’t a lazy, good-for-nothing rake. Well, perhaps not good-for-nothing at all. He’d been incredibly exciting in bed years ago. What a pity that one wild night was the cause of so much trouble now. She crept slowly across the roof, keeping low. There were two windows; when she reached the one behind which a light showed, she raised herself slowly until her eyes cleared the sill. She peered through a gap in the curtains. There he was, the good-looking devil, slouched on the sofa, running his hands through his thick, wavy, annoyingly gorgeous hair. The fireplace glowed with fading coals; a wine bottle and a chipped cup sat on the table beside a pile of newspapers. The very papers in which she’d advertised! She would gladly strangle him if she didn’t need his help. She sneaked to the next window, which she knew from the previous evening’s reconnaissance was Colin’s bedchamber. He slept with it open, impervious to the smoke and grime. She would never understand why anyone chose to live in this filthy city. Colin had a perfectly good estate in Lancashire a few hours’ ride from her own house, in the brisk, clean countryside. Gently, she pushed on the window sash. She eased it up, four, eight, twelve, sixteen inches. Listened—no sound from within. She glanced about—no one. Now or never. She rose, shoved the window up hard, and climbed through, one leg, then her body, then the other leg. The bunched-up skirts of her gown caught on the sill, ripping as she yanked it through. She lost her balance and tumbled to the floor. Ah, well. She’d hoped for a more dignified meeting, but this would have to do. She stood and began calmly untying her skirts. Calmly in appearance, at least; her heart thudded chaotically and her fingers fumbled with the knots. Colin Warren appeared in the doorway of his bedchamber, a branch of candles in one hand. Her breath caught, just as it had the first time she’d seen him, several years ago. What was it about him? Certainly, he was a handsome fellow. He had enough charm for ten men and knew his way around the bedchamber. But otherwise he was useless. She shouldn’t be so profoundly affected by him. He stared, bemused and not particularly disturbed, as she got the knots undone and her skirts fell to her ankles where they belonged. At least he remembered her. Being ignored was bad enough, but she’d felt almost ashamed that that one experience had meant so much to her and so little to him. He flipped a stray lock—he needed a haircut—off his brow. His hair was what had attracted her to him in the first place, all those years ago—a rich, dense brown, unlike her unmanageable, whisper-fine black. And then he’d smiled. Dimples. What idiot fell for a man because of his dimples? Especially when that smile was for some other woman, and not a respectable one at that. But she’d done it, then and there. And plotted to get into his bed for just one night. She’d been a widow for months, and she’d missed being bedded. She still missed it, but couldn’t afford any more stupid risks. “I’m here to talk.” She whirled and shut the window, banging it down hard. “I shall be happy to leave once we’ve had our discussion,” Bridget said. “Yes, thank you.” There they were, two pages of The Times from last week, containing the columns where she’d advertised. Yesterday’s paper hadn’t been opened yet. Maybe he hadn’t seen that one. She hoped not; she’d stooped, appallingly, to offering him another wild night. She’d come to the point of risking almost anything to foil Martin Fallow. He took a glass from a cabinet, dusted it with his shirtsleeve, and poured her some wine. And grinned. Those dimples—Mother Mary and all the saints, they made her ache. “My man collects them,” he said. She wrinkled her nose and took the glass of wine, her mind’s eye conjuring a vision of herself among crowds of women bowing down to this God of Dimples.